Frankly, there is a great deal of stuff online that is garbage. It is poorly written or produced. Sometimes it is just plain wrong. At other times it is offensive or annoying in some way. There is literally tonnes of such material out there…! When was the last time you felt inspired by something you read or watched online? It turns out that this is what we are looking for more than anything else. 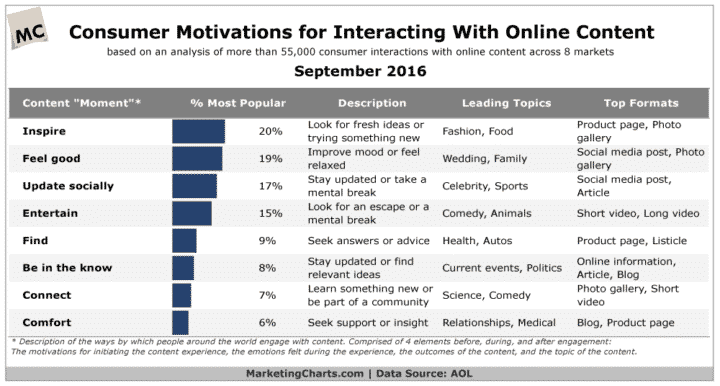 A new study by AOL shows that the most frequently preferred “moments” online are those which inspire us. The study found that people are mostly inspired by fresh ideas or something that is new. This ties in with psychological research on what interests people online. We are much more interested in fresh and new things as a result of our survival instincts. These have developed to ensure that we only eat fresh foods, thereby aiding our survival in the avoidance of potentially poisonous material. That survival instinct for freshness kicks-in throughout your life. You want the latest news, the latest fashions, the latest football scores and so on. We are driven by survival to seek freshness in a whole host of situations. So it is no surprise that online the desire for something fresh and new is a significant driver. However, the AOL study also found that making people feel good was very important to users of the Internet. Again, this is not really much of a surprise – personal emotions are fundamental to almost everything we do. How you feel about things determines how well you accept them. Emotion underlies your customer purchasing decisions, and so it is too that triggering those personal emotions is essential in the web pages you produce. Importantly, though, the research from AOL found that different “moments” as they call them appeal in varying degrees according to the sector. So, freshness was fundamental to people interested in fashion but was less important to people seeking medical information, who clearly wanted the comfort of reliability. What this means – once again – for anyone with a website is that there is no “rule” that covers every eventuality. The AOL study confirms once more that you really need to understand your audience in great depth. The more you know about your website visitors, the more you can target them with appropriate content, delivered in the right manner for them. So, the question is, how well do you know your audience? Do you know if they prefer you to have content that offers freshness over reliability? Or do they want to learn something new, before they even consider entertainment? There is no simple answer to the content conundrum other than doing detailed audience research. How well do you really and truly know your website visitors? Use your web analytics: focus on the detail of what people are searching for, what pages they stick on for a long time and where they go. Look at their behaviour patterns on your site so that you will be able to identify what triggers them. Check your social media: what are people retweeting or commenting on? Look at the kind of pages from your website that get shared and talked about. This will give you another clue as to what people prefer. Surveys and polls: conduct surveys and polls. To select survey software, check out this article from PC Mag. Use eye-tracking: Look at what they look at. You don’t need fancy studies, you can gauge what people are interested in using software such as Crazy Egg. Talk to them: you will find out a considerable amount about the desires and requirements of your audience by talking to them. Phone them up, meet them in person, attend the same events they go to, hold focus groups – do anything you can to speak with them. Ultimately, this is by far the best method of audience research as you will also get a “feeling” from speaking with people and will be able to assess what they really like using body language and so on. When was the last time you felt inspired by something you read or watched online? Well, I frequently read Quora a lot and believe me this is the best source of knowledge this time. Like minded peoples from all over the world gather here and provides best studies.